Purchase a $100 gift card Thursday November 22rd through Monday November 26th online for $80. 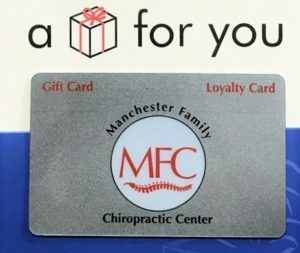 Gift cards can be used for any service or product at MFCC. After purchase the gift cards will be available for pickup starting Monday November 27, 2017. Limit 3 per person. Purchase a custom Pillowise pillow today for $110.00 for yourself or a loved one and save $20 off the retail cost and pay no shipping. After purchasing the Pillowise pillow an appointment needs to be scheduled to measure and fit you for the correct pillow size. If not in stock the pillow will be ordered and can be picked up at the office. Ask us for details. Buy a package of 3-one hour massages with Meagan and save $50! This can be used for yourself or given as a gift card upon request. Please specify in the notes if this is a gift and we’d be glad to include a gift card for the lucky person. Otherwise a credit will be placed to your account. Purchase 4 regular priced thirty minute massages for $110. That’s a $30.00 savings. Experience all the benefits of massage therapy for yourself or give as a holiday gift card. Please specify in the notes if this is a gift and we’d be glad to include a gift card for the lucky person. Otherwise a credit will be placed to your account. If you have any questions regarding our specials, contact us today at (517) 962-2178.